Popplers Music offers quality, name-brand new and gently used instruments that are shop adjusted, play tested, and educator approved. 100% of your payments will go toward the purchase of your instrument, with payments starting as low as $20 per month! No contract will extend beyond 36 months. We make it easy to purchase your instrument. All instruments require regular maintenance to stay in proper playing condition. For a small monthly fee, our optional Repair & Maintenance plan covers the cost of necessary repairs and provides an instrument on loan while repairs are in progress. 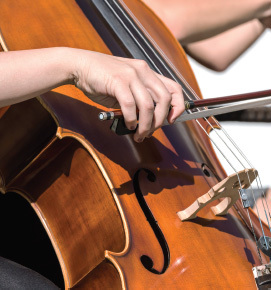 We employ certified instrument technicians, and our service is fast, reliable, and guaranteed! Our Lease - to - Purchase plan is a month to month contract, that never extends beyond 36 months. You may return your instrument at any time if you choose not to continue. We also offer a discount if you choose to purchase your instrument within 18 months of starting the lease. If your child is not successful with their first choice, you can exchange it for a different instrument during the first six months of the contract. Your lease payments will still apply toward the purchase. Our lease instruments are equipped with all of the required accessories to begin your musical adventure, including the proper lesson book! We also offer the use of a music stand to hold your lesson book during practice. When you need to purchase new supplies or music, you will find what you need at our stores — our sales staff is knowledgeable and prepared to help you. Popplers offers the opportunity to upgrade to a Performance Quality instrument at any time during the lease, with 85% of your lease payments applying to the purchase of the instrument. As your child’s musicianship progresses, you can reward them with an instrument that will carry them to greater levels of mastery.